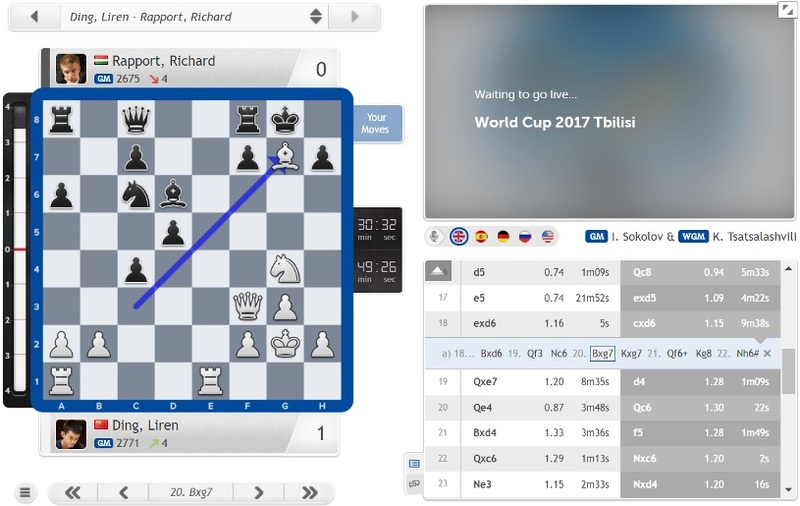 Wesley So and Ding Liren meet in the semifinals of the 2017 World Cup after giving masterclasses with the white pieces to win their quarterfinal matches against Vladimir Fedoseev and Richard Rapport. 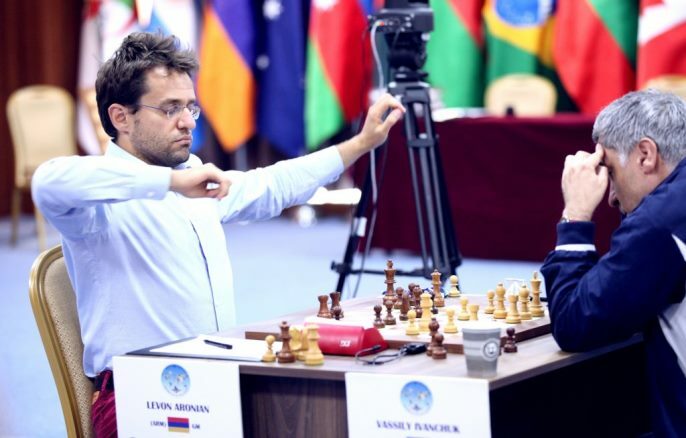 Levon Aronian joins them after Vassily Ivanchuk put up a great fight in the second game but was ultimately unable to prevent a draw. 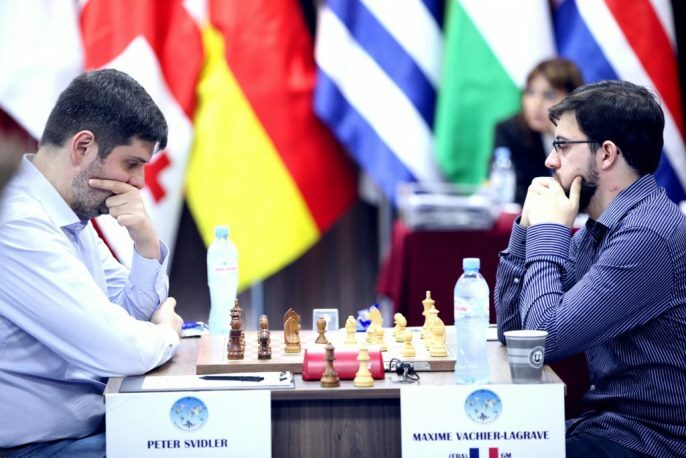 His opponent will be either Peter Svidler or Maxime Vachier-Lagrave (“I hate them both!”) after they played out a tense draw with mutual chances and now go into tiebreaks on Sunday. 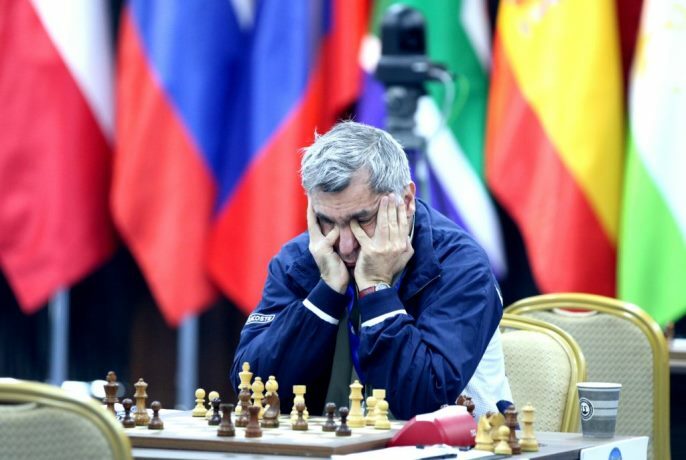 Vassily Ivanchuk’s army of fans were worried after his loss to Levon Aronian in the first game of their match. It wasn’t so much the fact of losing to the Armenian no. 1, which could happen to anyone, but the way it occurred – the reckless time management, poor decision-making and premature resignation. Could the mercurial Ukrainian pull himself together and at least make a fight of the second game? Such games are always tense, so I expected this and I knew that I had to have the intensity to pass through. I was trying to play my best but still, I think I was playing too slow at some point. I should have played faster, and then my opponent was trying to exploit that fact. At one moment when I played 49…Bc5 I felt his 50.Bc1 was too passive. I felt he should have gone for 50.Bf4. It would give him more chances to fight, because once I play 50…g5 I’m released of any danger, generally, and then I can play with my hand. That’s always a pleasure - when you’re in time trouble just not to have a position where you have to carefully watch out for threats. I hate them both! Both are very, very annoying opponents, so let’s see who proves to be worthier. I’m fine! You know, it’s kind of a thing, you either work really hard and have a rest day, or you just relax and have a tiebreak. 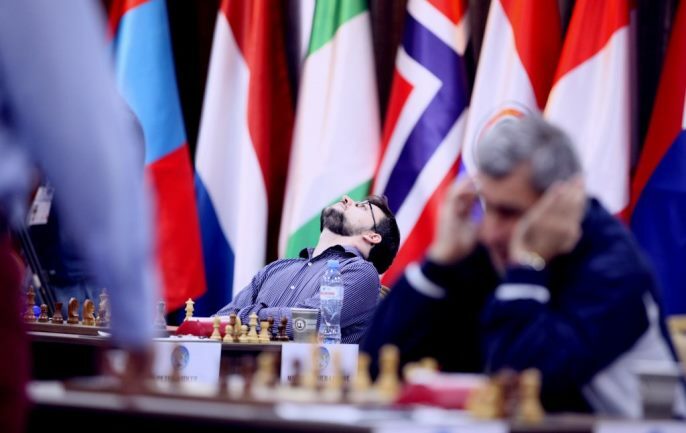 Neither of those scenarios applies to Peter Svidler and Maxime Vachier-Lagrave, who played out a second relatively quick but extremely tense draw that could easily have proven decisive. You don’t need to be Peter Svidler to see that 18…Bxd4 19.cxd4 Qxb5 wins a pawn, but it was also clear that White would in return get a huge pawn centre and significant attacking chances. After 11 minutes’ thought Peter went for 18…Re7, with MVL choosing to challenge that rook with 19.Ndf5. Svidler didn’t retreat but advanced the rook with 19…Re6?! This is a scary position, with 20.Nxg7 or 20.Nxh6+ followed by 21.f5 very serious options, while it turns out preparing Nxg7 with 20.Qd2! may be even stronger. Peter Svidler’s fans held their breath, and couldn’t relax when MVL’s 20.Nd4!? was met by 20…Re7. It was the penultimate round of the Sinquefield Cup all over again, when Aronian and Svidler had repeated moves in a position laced with peril. Eventually, though, MVL went for 21.b4! ?, which would have been stronger when the knight was on f5. Now Svidler could finally take on d4 and grab the b5-pawn with 21…Bxd4 22.cxd4 Qxb5. When 23.f5 was played it was accompanied by a draw offer. He couldn’t see how to make progress, while White still had the potential to whip up an attack on the black king. Maxime accepted and it was the kind of draw after which both players breathe a sigh of relief. That match now goes to tiebreaks, while the remaining two encounters were decided on Saturday. 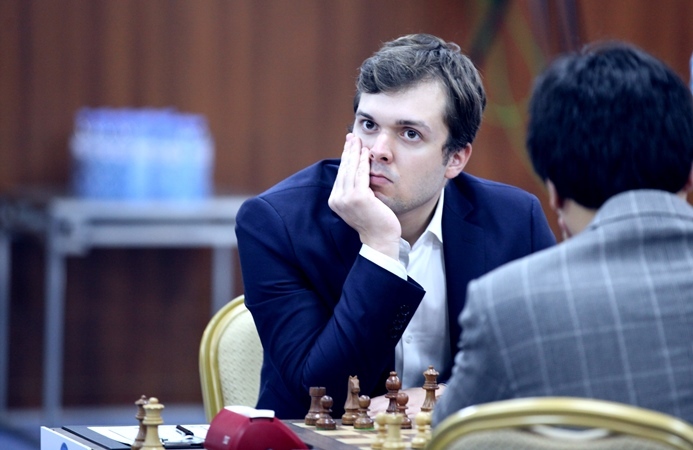 The flow of upsets that had seen us lose the likes of Carlsen, Caruana, Mamedyarov, Anand, Nakamura and Karjakin had already dried up in Round 4 and in the quarterfinals we’ve seen the current elite players demonstrating exactly why they have that status. Whatever happens in Sunday’s tiebreak we’ll have only 2750+ rated Top 15 players in the semifinals. Yesterday I know maybe my position is equal and maybe slightly better, but I think I’m confident with my white pieces so I will try to push with White. There followed 17…exd5 18.exd6! and here Black was forced to play 18…cxd6 and give up a piece on e7, since as Ding Liren explained afterwards he’d seen 18…Bxd6 19.Qf3! Nc6 20.Bxg7! and if Black takes the bishop it’s mate-in-2. Black is also lost after other moves, with the threat of Qxd5 looming. I thought I would win immediately after 20.Qe4, but I missed 20…Qc6, but fortunately the position’s still much better for me and I can play very simply. After he exchanged the queens I played very simply and the rook endgame is very unpleasant for him. Rapport resigned on move 41 and his fine World Cup was over. It’s very tough to beat somebody, because no-one wants to go home. I think it’s also very tough for my opponent, but at the end of the day someone has got to win, and I especially don’t want to go yet. So I tried really hard today. It’s really good that I managed to convert this and I’d like to thank the Lord for letting me win the match. 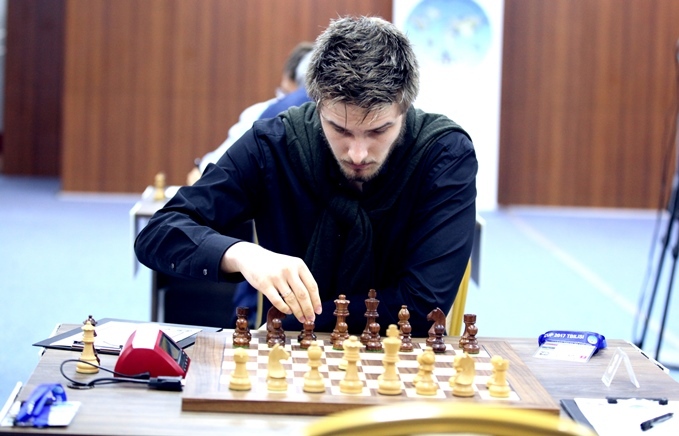 I didn’t really expect to win today because Vladimir Fedoseev is a very good player and everybody notices he’s gained like 80 points in the last 5 months and he prepared really well today. At some point I thought the game was just going to end in a draw. Against as brilliant a technical player as Wesley So it was real credit to Vladimir Fedoseev that he managed to stay in the game so long, but while Wesley failed to find a way through with rooks and bishops on the board he then gradually realised that the bishop ending was very good for him. 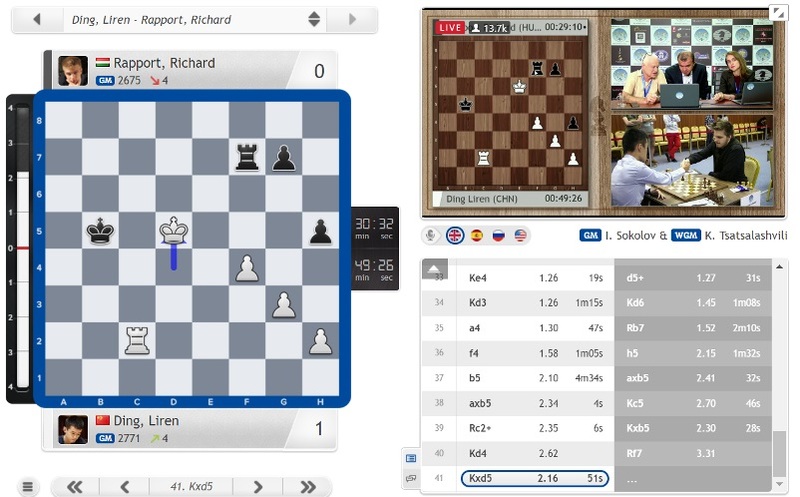 He swapped off rooks and felt the game was essentially over when Fedoseev put his king on c6 rather than e6. All he needed to do was put his bishop on e5, and though it took a long and circuitous route it finally got there! 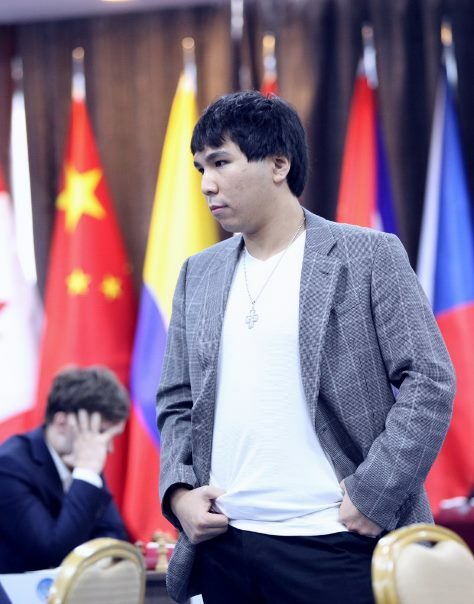 That impressive victory against a player who’s well and truly announced his arrival on the world stage means that Wesley So now plays Ding Liren in a World Cup semifinal that starts on Tuesday. 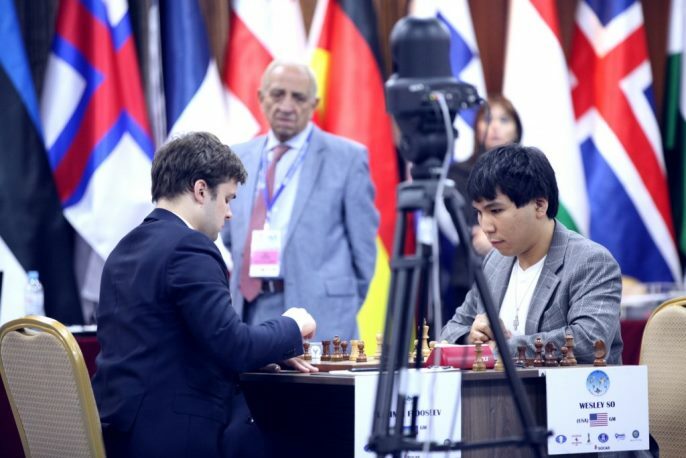 Although only lasting two games as in the other rounds, the semifinals are arguably much more important than the final match, since both finalists will already have qualified for the Candidates Tournament. Either Wesley So or Ding Liren will qualify for the first time, and if Wesley does it then Fabiano Caruana and Vladimir Kramnik will be almost guaranteed to play in the Candidates as well as rating qualifiers. 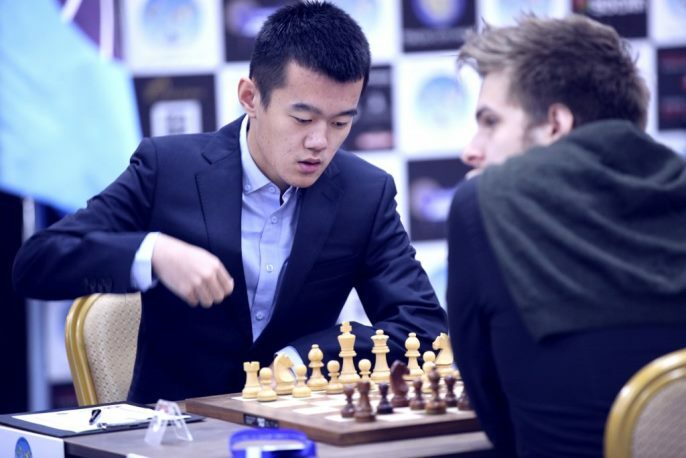 Wesley noted that he lost a match to Ding Liren in China last year after losing one game with three draws, but as he also noted, “a lot of water has flowed under the bridge since then”. 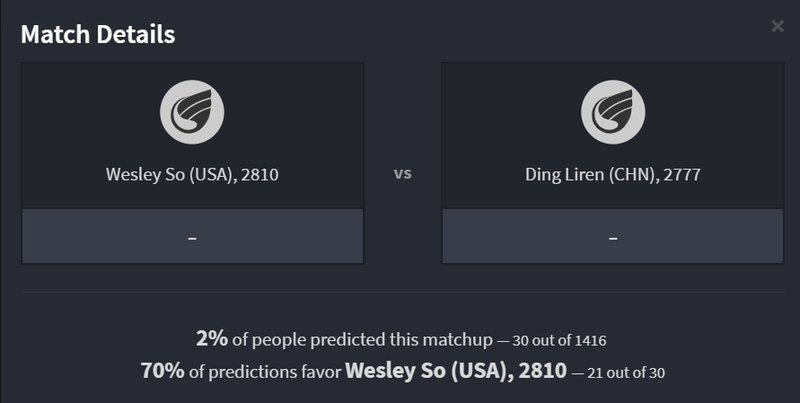 Something will have to give, since both Wesley and Ding Liren are unbeaten in Tbilisi so far. So-Ding Liren was tough to predict (only 30 out of 1416 managed!) but one prediction to get that right, Magical Magyars, currently leads our Prediction contest - it predicts MVL getting to the semis before Aronian wins a final against Ding Liren! That’s not all for the quarterfinal action, though, since Peter Svidler and Maxime Vachier-Lagrave must still play tiebreaks to determine who takes on Levon Aronian in the semifinal. Catch all the games here on chess24 from 13:00 CEST onwards!